San Juan was the cousin of Jesus and his spiritual precursor. When Jesus began his mission Juan baptized him in the River Jordan. Juan was the first to recognize Jesus as the Messiah and declared him to be the Lamb of God. 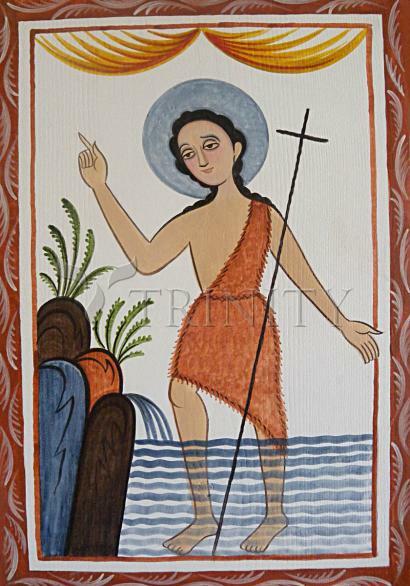 In sacred art Juan is shown dressed in animal skins standing at the banks of the Jordan River. Sometimes he carries a twig staff or a lamb and points heavenward. In New Mexico the 16th century Spanish colonizer Juan de Onate named a native pueblo San Juan de los Caballeros in honor of the saint. It is believed all waters become pure on his feast day, June 24. San Juan is the patron of sheep, shepherds, hermits, and the purity of all water. His feast day is June 24. John was the cousin of Jesus Christ and the son of Zachary, a priest of the order of Abia whose job in the temple was to burn incense; and of Elizabeth, a descendent of Aaron. As Zachary was ministering in the Temple, an angel brought him news that Elizabeth would bear a child filled with the Holy Spirit from the moment of his birth. Zachary doubted and was struck dumb until John's birth. John was a prophet who began his ministry around age 27, wearing a leather belt and a tunic of camel hair, living off locusts and wild honey, and preaching a message of repentance to the people of Jerusalem. He converted many, and prepared the way for the coming of Jesus. He Baptized Christ, after which he stepped away and told his disciples to follow Jesus. John was imprisoned by King Herod. He died a victim of the vengeance of a jealous woman. John was beheaded, and his head brought to her on a platter. St. Jerome says Herodias kept the head for a long time after, occassionally stabbing the tongue with his dagger. The Church observes the birth of John as a hallowed event. We have no such commemoration for any other fathers; but it is significant that we celebrate the birthdays of John and of Jesus. This day cannot be passed by. And even if my explanation does not match the dignity of the feast, you may still meditate on it with great depth and profit. John appears as the boundary between the two testaments, the old and the new. That he is a sort of boundary the Lord himself bears witness, when he speaks of "the law and the prophets up until John the Baptist." Thus he represents times past and is the herald of the new era to come. As a representative of the past, he is born of aged parents; as a herald of the new era, he is declared to be a prophet while still in his mother's womb. For when yet unborn, he leapt in his mother's womb at the arrival of blessed Mary. In that womb he had already been designated a prophet, even before he was born; it was revealed that he was to be Christ's precursor, before they ever saw one another. These are divine happenings, going beyond the limits of our human frailty. When John was preaching the Lord's coming he was asked, "Who are you?" And he replied: "I am the voice of one crying in the wilderness." The voice is John, but the Lord "in the beginning was the Word." John was a voice that lasted only for a time; Christ, the Word in the beginning, is eternal.